This scallop recipe will teach you everything you need to know to cook fantastic pan-seared scallops. Very gourmet, this appetizer is surprisingly easy to make—the cooking time is literally 10 minutes! And the results? If you like seafood, you're going to fall in love with these melt-in-your-mouth scallops, as well as the sumptuously simple sauce that accompanies them. Great for serving at a dinner party as an appetizer, or on a bed of mixed garden greens for a romantic tapas for two. Enjoy! Rinse scallops and pat dry. The scallops must be very dry before frying in order to achieve a good sear. Warm a wok or large frying pan over medium-high heat (allow the pan to warm up at least 1 minute). Add 2 tbsp. oil to the wok or frying pan and swirl around. Gently place the scallops in the pan, leaving enough space between so you'll have room to turn. Allow scallops to sear undisturbed for at least 2 minutes (trying to turn them too early will cause the skin to tear). While cooking, season them with a pinch of salt and black pepper. Use an egg-turner to gently turn the scallops. Season once more with salt and pepper. Scallops are done when both sides have a nice crispy-looking crust and are firm to the touch. Remove scallops from the wok/pan and place on paper towel or clean tea towel to drain. Place all sauce ingredients in a saucepan over medium heat-high. Stirring occasionally, warm the sauce for 1 to 2 minutes only - just long enough to bring out the flavor of the garlic and turn the fresh chili (or bell pepper) bright red. Avoid cooking the sauce. Remove from heat and taste-test, adding a little more fish sauce if not salty enough (1 tsp. ), or a little more lime juice if too salty. Add a little sugar if too sour. 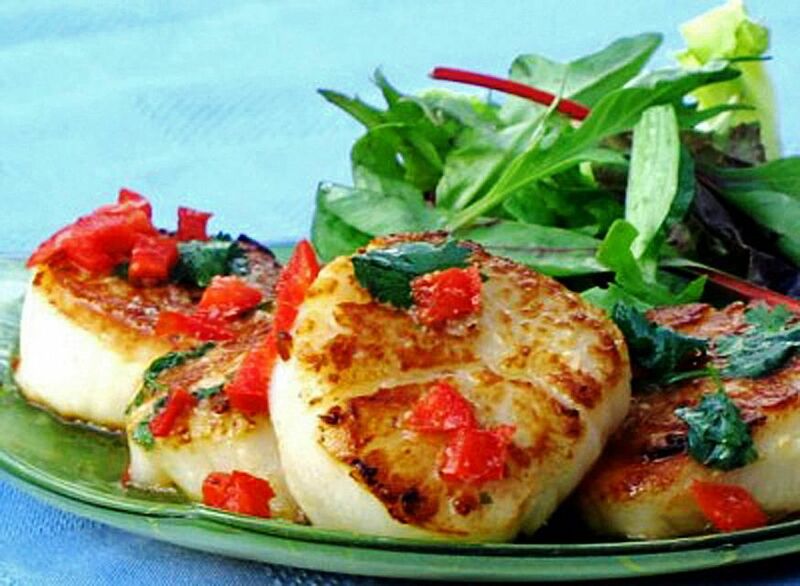 Place scallops on a bed of lettuce with the fresh coriander and basil. Pour or spoon the sauce over the scallops. Serve as is, with rice, or with a little French bread to soak up the juices. ENJOY!